Many early mathematicians believed that numbers of the form (2 to the n)-1 were prime for any n that is a prime. But in 1536, Hudalricus Regius demonstrated that (2 to the 11th)-1 = 2047 is not prime (it is 23*89). By 1603, Pietro Cataldi had correctly verified that (2 to the 17th)-1 and (2 to the 19th)-1 are both prime, but then incorrectly stated (2 to the n)-1 was also prime for 23, 29, 31 and 37. In 1640, Fermat corrected Cataldi on 23 and 37; then Euler, in 1738, showed Cataldi was also wrong about 29.
and were composite for all other positive integers n < 257. Mersenne’s proposition fared only slightly better than Regius’ and Cataldi’s (Euler soon after knocked off 31)… but still got his name attached to numbers of this form. GIMPS– The Great Internet Mersenne Prime Search— is a collaborative online project aimed at discovering ever-larger Mersenne primes… and GIMPS, which has since its inception in 1996 uncovered ten of the 44 known, may now have found a 45th. The 44th Mersenne prime was over 9.8 million digits long, strongly suggesting that the new value may break the 10 million digit barrier, thus (and lest anyone suggest that math doesn’t pay) qualifying for EFF’s $100,000 cooperative computing prize! Verification– which may take two weeks– is under way now. As we oil our abaci, we might blow off a little birthday steam for Matthew Boulton, the manufacturer and engineer, who was born on this date 1728– and who who pioneered the steam engine with James Watt. 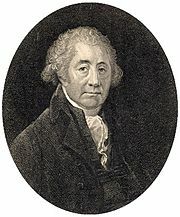 Like Watt, Boulton was a member of the Lunar Society, which (as long-time readers will recall) also included Erasmus Darwin, Samuel Galton, Jr, Joseph Priestley, Josiah Wedgwood, Sir Richard Arkwright, John Baskerville, Benjamin Franklin, Thomas Jefferson, Anna Seward and Thomas Wedgwood.